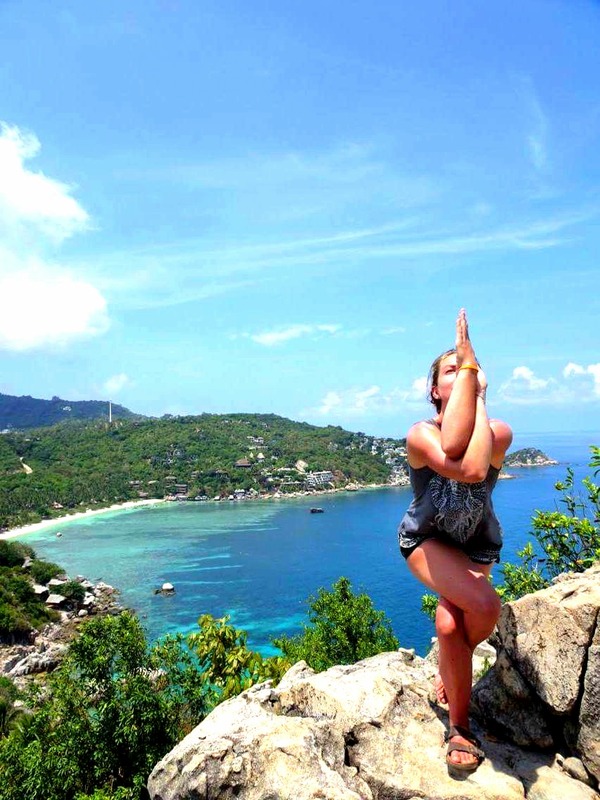 We climbed to a truly spectacular view point yesterday on the island of Koh Tao. Even though I was exhausted, exceptionally sweaty and hot, what we saw from the top was totally worth it. Walking in this heat makes my legs feel super tight so my practise recently has been about releasing tight legs. Hopefully, once WiFi improves, I’ll be able to upload you guys a sequence I’ve just filmed about improving leg flexibility. It’s a sequence I include in my daily practice. Here’s a sneak preview. Eagle pose is great to finish a leg opening sequence with. Stand on one leg, bend at the knee and sit the sitting bones back slightly. Bring the other leg over the top of your grounded leg avoiding the knee joint. Trying to keep your balance, almost intertwine the legs together. Aim to eventually bring the leg all the way around, until the back of the foot acts as an anchor around your grounded legs calf. When it comes to hands I started practicing this posture with Namaste at heart centre. If you can intertwine your arms too, once you’ve done this, try to lengthen them up to the sky as well. Always practise both sides. Eagle pose is great for strengthening and stretching your ankles, among other benefits! If you can get your hands like a pretzel as well, then its also a brilliant release on the shoulderblades.